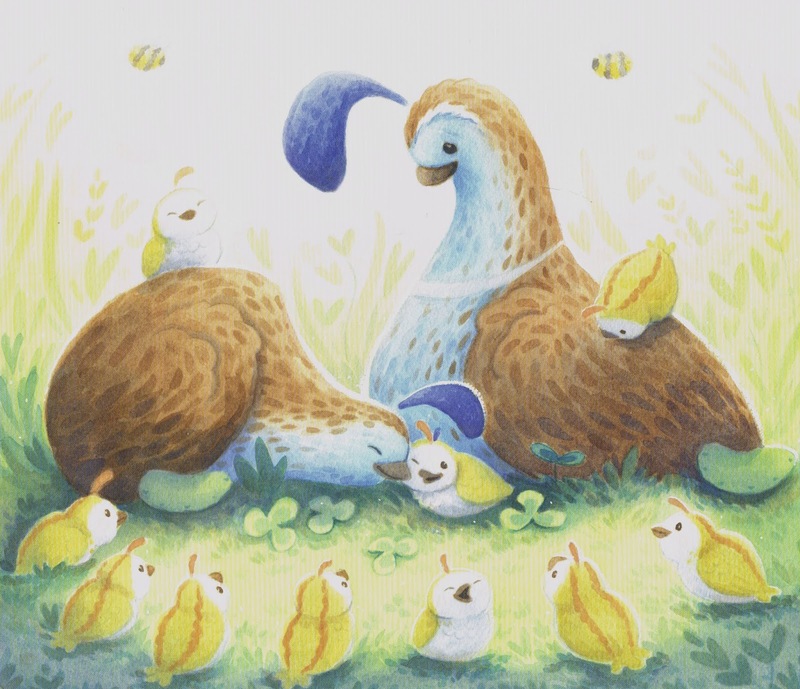 Queenie Quail may always be the last one to catch up to her parents and nine siblings when the flock goes out but she's the first to see danger when it's lurking in the grass. Seems being a dawdler has its advantages. Whether quail or human child, the dawdler is not an uncommon concern for parents. And for Mama and Papa Quail, keeping ten little ones together is always necessary when snakes and foxes and raccoons and cats–oh my!–are always searching for prey. With the rhythmic sounds of heads "bob bob bob"-ing and the "tap tap tap" of little feet, the "ten round bodies went hurry hurry hurry" but Queenie can't keep up, no matter how often they stop to cheep at her. She's distracted by the pink blossoms and the green grass and the shiny stones and the fuzzy caterpillars and more. An unusual flash of orange. A furry kind of orange. A moving kind of orange. Finally given reason to hurry, Queenie alerts her family and her parents squawk into action. Not surprising that Queenie's siblings learn the value in stopping to really see along their daily treks from then on. Though quails are usually very quiet unless startled, Jane Whittingham gives them voice in Queenie Quail Can't Keep Up and your little ones will enjoy the repetitive chirps of the quails as they move and urge Queenie to hurry. Moreover, by boldly colouring certain phrases or words, including those repeated three times in succession, even non-readers will be able to pick up on key words and read along. Beyond the text, the story content has important embedded messages about sticking together for safety as well as taking the time to really see along the journey. Queenie Quail may be a challenge for her family because she doesn't march to the same drummer as they do but that same difference also makes her an asset. Her observational skills and appreciation of what she sees around her is a testimonial to the benefit of mindfulness, taking in the moment and all it entails. 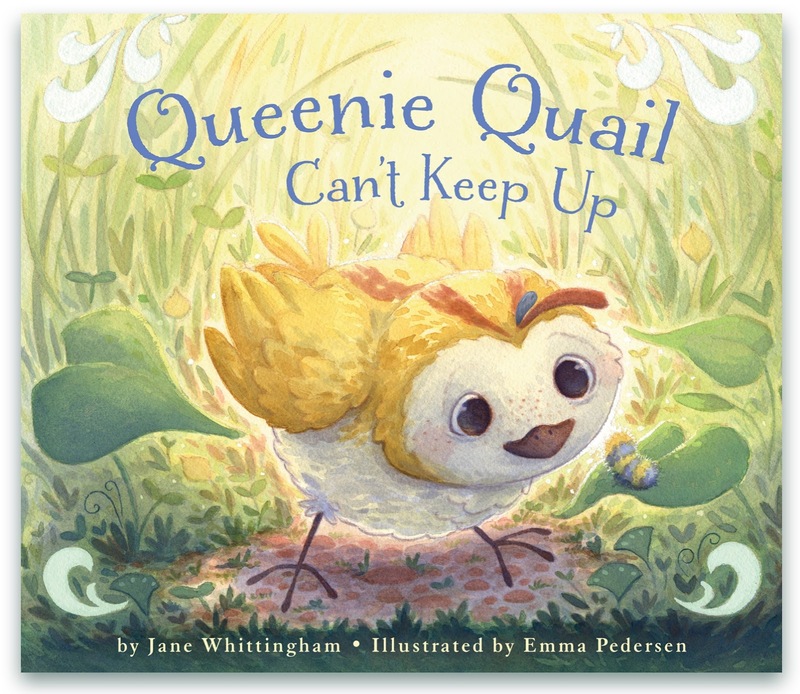 Queenie Quail Can't Keep Up is Toronto artist Emma Pedersen's first picture book and she does Queenie and her family, as well as Jane Whittingham, proud. Though Emma Pedersen ensures that the quail are truly quail-like, with their head plumes, known as topknots, of which Queenie's is bi-coloured, and elongated bodies for adults and rounded-bodied young, she has given them her own personal stamp of cuteness. In fact, with the adorable facial expressions on the chicks and parents, Emma Pedersen anthropomorphizes the quails just enough to help children see themselves and their families within. Similarly, the landscapes Emma Pedersen creates of stylized plants are both real and fantastical, enriching each page of the story. While the basis of Queenie Quail Can't Keep Up may be appear to be a scolding at an errant youngster, it delightfully turns into a lesson about the value in stopping to smell the grass and the blossoms and see the amazing in our surroundings, to the betterment and safety of all. Thank you so much, Helen, for featuring Queenie, and for your lovely words! !